Following on from my Astra photography session on new year's eve I decided that my next session should be an observational. The weather forecaster the night looked really good plenty of clear skies and nice cool temperatures with no wind. I took out two tables and SBT and set them both up in the the back garden. At first I just sat down and looked around the sky to see what constellations were visible from my position. Once it had orientated myself, I took out my sky atlas and started looking for targets in the night sky. The first target for tonight was a target that I have only seen once before. It is called the blue snowball nebula. The blue snowball nebula is designated NGC 7662. Next on my list was another target that had seen before. M 33 is known as the Pinwheel galaxy or the Triangulum galaxy and is designated NGC 598. Unfortunately on this occasion I found it a little underwhelming even through the large aperture of the SBT. NGC 1499 or the Californian nebula was an object on my list that it had not seen before. I used the Telrad to locate where the nebula should be. I didn't know what to nebula was supposed to look like so didn't know if it was looking at the correct feature. In my notebook I have noted a question asking myself if it was a dark nebula? The reason for this was that what I could observe was a fairly large dark mass amongst some very dim stars in the area that it should be. I obviously need to research there's a little further before confirming. I have a series of books that are designed to work with a Telrad finder. One of the books is a list of often overlooked objects. I decided to work through this list and pick out my next objects to observe. NGC 2281 is the broken heart cluster. Though I have seen this before I wanted to seek it out again. It is a really pretty cluster made up of a double line of stars arranged in the shape of half a heart. All of the objects that we observe usually have catalogue numbers assigned to them. So far in this session I had observed objects found in the New General Catalogue, but this next target also features in the Caldwall catalogue and is designated as C7 or NGC 2403. C7 is an intermediate spiral galaxy. It has a magnitude of 8.9 but is also quite small. At first I could see two main stars with what I thought was some nebulosity, but after checking I could see that it was the core of the spiral galaxy. I couldn't make out any structure beyond the two stars though. This was a very tough object to find! Sticking with the Caldwall catalogue I moved on to C 39 or NGC 2392 - The Eskimo nebula. This is a very small target and even though I think it have seen it before I would have mistook it for a double star if it were not for a blue tinge to it. It is listed as magnitude 10. The clear and moonless conditions for the night allowed me to find it, but the local light pollution caused by neighbours lights added to the difficulty of picking it out. Next came a magnitude 10.4 edge on galaxy designated as NGC 2683. I am really pleased that I managed to attract this target down. I saw a small slit of light grey fuzziness in the eyepiece. The more time I spent looking at the target, the longer the slit of light appeared to get as my eyes become more accustomed to the view. Definitely a Top Tick! The night was moving on and it was getting late so with work to consider for the next morning, I had time for one more target before packing up. The final target for the night was another spiral galaxy. At magnitudes 10.1 it is designated NGC 2841. It has a small bright core and has a very distinguishable visible pair of stars designated HP 45965 and HP 45922 on the outer point of the galaxy. A quote from my observer notes simply says, " this is what the SBT was made for!" This brought the end to a you really worthwhile first observational session of the year. Thanks for taking the time to read as post. Don't forget you can subscribe to my blog posts by typing in your e-mail address into the subscribe field at the end of this post. You will then receive blog posts via e-mail. Cheers! Saying Goodbye to 2015 from under the stars. December 31st 2015. The end of another year. I seem to be saying this a lot recently, but chances to get under the stars for some observing or photography have been very few in numbers. It was looking like I'd had my allocation for 2015. The countrywide dreadful weather has put any chances of getting out to the sword recently. I was resigned to calling it a year, when, the forecast for New Years Eve started to display some signs of promise. For the first time, I was due to be on my own for the New Year. This gave me the opportunity to do what I wanted, and see in 2016 how I wanted. On my mini astro bucket list was to try to find and observe from other dark sites, and to try to get out of the back garden. For a while, I had considered the car park of the Golf Club of which I am a member, as a suitable location. Around 15 minutes drive out from Ross, it gives excellent views to the East, South and West with good views to the North. It's away from any street lighting or other local light pollution from houses. So, venue sorted, I turned my attentions to what I would do. I considered loading the car up with as much astronomy gear as I could, but the size on the vehicle, plus the fact that I had to take the trusty hound Gelert, meant that I had to kerb my enthusiasm somewhat and choose one discipline or another. After a bit of thought, I decided on some astrophotography with the DSLR and iOptron Skytracker. I am still very much in the discovery phase of finding out what the capabilities of my setup are. 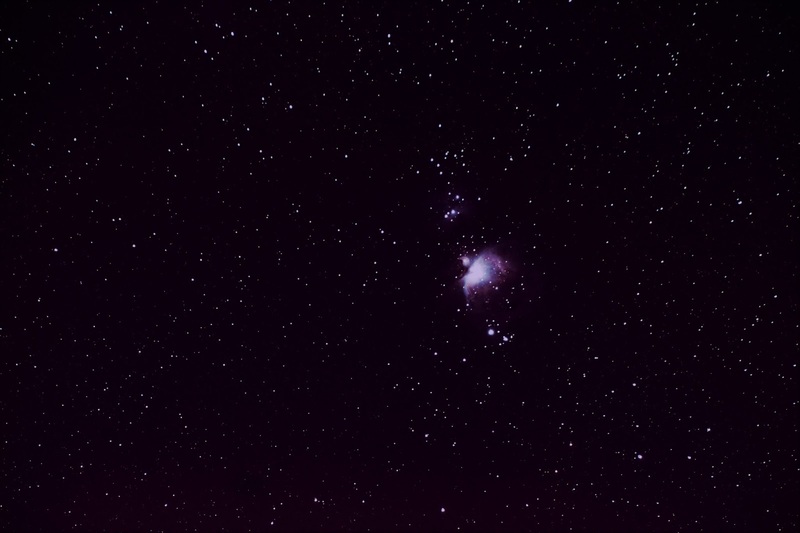 A very popular target for this sort of imaging is M42, the Orion Nebula. I put that on the list. But, also I was interested in the constellation of Orion as a whole, and the other nebulae and clusters contained within it. Finally, I considered also the Triangulum, or Pinwheel galaxy. This is currently high up in the later evening sky, and I have seen other people successfully get enough data and form and image of the spiral galaxy. I put this on the list as a reserve. That decided, the flasks of coffee were made, the car was loaded and I drove out to the golf club. I arrived at the golf club carpark, and when I got out the car, I was present with a crystal clear sky, and thousands of stars littering the sky. Orion had already started its gradual climb into the sky, so I decided that it would form the main part of the imaging evening. The Triangulum galaxy could wait for another time as this is visible for a longer period throughout the year. All the kit was turned out the car, and rigging up complete, I was ready to go. Throughout the session, I collected data on 3 different areas of the Orion constellation. I've managed to produce 2 pictures from the 3 sets of data collected that I think are reasonable. I will need to re-visit the 3rd set of data, and reprocess it to get a more acceptable end result. I've produced a 3rd picture by cropping out some of the background of the original. So, without further delay, here are the results. Nebulae in Orion, made up of the Running Man nebula, de Marian's nebula and the Great Nebula in Orion. Produced from 30 x 60 second exposures. ISO 800. f/5.6. 5 x dark frames and 5 x bias frames. A cropped version of the previous image showing the 3 individual nebulae slightly closer. 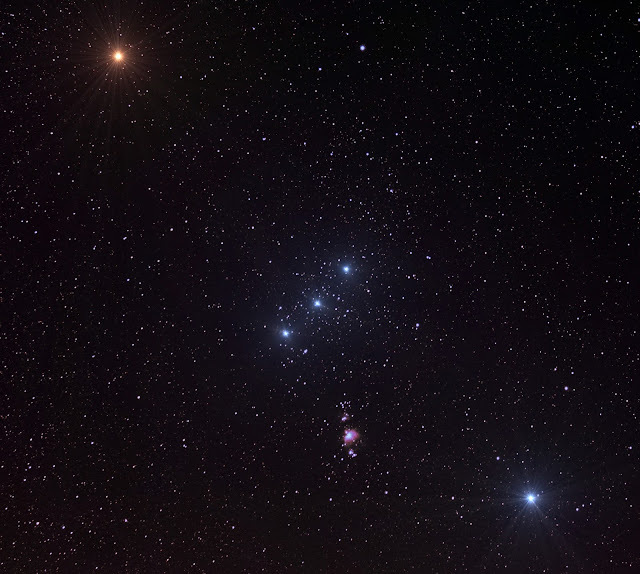 A wide field shot of most of the constellation of Orion. It shows Betelgeuse (the orange colour star at the top left of the constellation. The 3 stars in a row forming Orion's Belt called (from left to right) Alnitak, Alnilam and Mintaka. The nebulae can be seen in their position within the constellation below Orion's belt, with variable star Rigel at the bottom right of the picture. This picture was made from 30 x 60 second exposures. ISO 800. f/5.6 with 5 dark frames and 5 bias frames. As the imaging sets were completing their runs, the early fireworks were going off in the distance over Ross. Whilst most of my friends and colleagues were undoubtedly in the process of enjoying a glass or two of shandy or grape juice, it was coffee for me. It would have been nice to have a few beers during the session, but driving put pay to that. It was however, a fantastic way to spend New Years Eve. I spent plenty of time laying back in the chair and staring skyward. I started thinking back over the events of 2015, good and bad. It's not everyone's idea of a good time, and a fun way to spend the last day of the year. But, for once, that didn't matter. I has a blast!